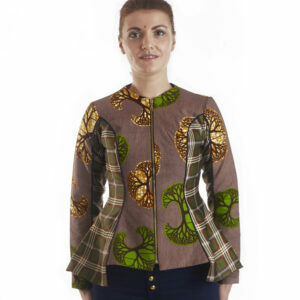 Jacket with notched lapel collar and three quarter sleeves. 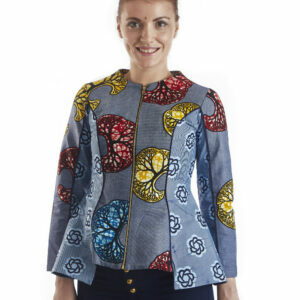 front zip-up fastening and contrasting, striped fabric lining.Made in Ghana with100% African Wax Print. Businesslike but also beautiful, this plaid jacket features a bold print pattern, a metal zip and hook finish and a minimalist, clean silhouette. 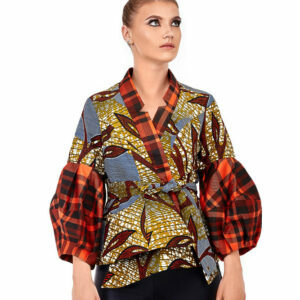 Asymmetric print jacket with plaid inverted lapel collar and cone sleeve. Matching tied belt around the waist with eyelets on belt and sleeve. 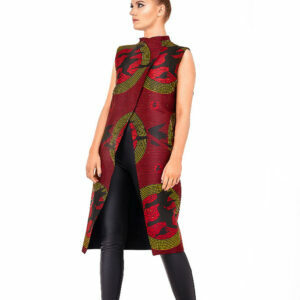 Businesslike but also beautiful, this jacket features a bold print pattern, a metal zip and hook finish and a minimalist, clean silhouette.